Cream-colored cotton kurta with stripes. Flowers, using pink and blue thread, are embroidered at the neckline and sleeves. 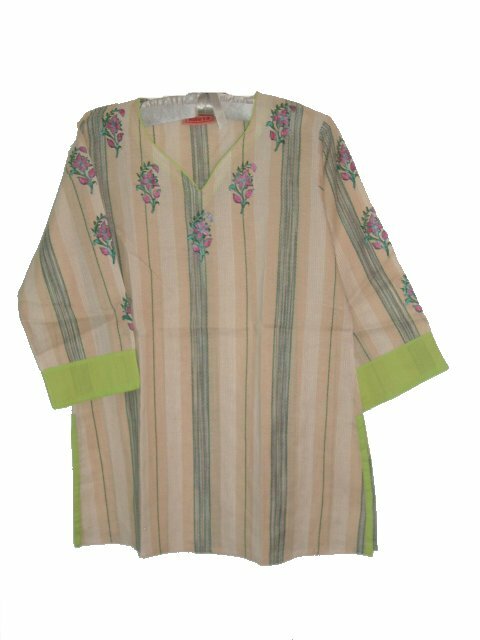 Vertical green stripes are embroidered along the length of the kurti too. Lime green fabric at the neckline, cuffs and vents adds a dash of color to the tunic. Sleeves are 3/4th length. The kurti made to keep you feeling cool and fresh in the summer heat.